Use masking tape or painters tape to ensure a straight cut. Secure the track in a miter box when cutting with a hacksaw. If using a miter saw, use a blade meant for cutting metal. Use tin snips to clip the corners of the wall jambs. Use a file for a snug fit. The wall jambs fit over the bottom track leaving a small amount of adjustability from the inside legs of the wall jambs. If the bottom track is cut on an angle or 1/4" (6 mm) too short, the legs of the wall jambs should provide sufficient space to cover the mistake. If desired, install the end caps to cover gaps or uneven cuts on the bottom track. The end cap will cover approximately 1/2" (13 mm) on each side. NOTE: Right side pivot is shown above. When cutting the bottom track, determine which side of the door will be open. Cut the bottom track on the end opposite the pivot end. 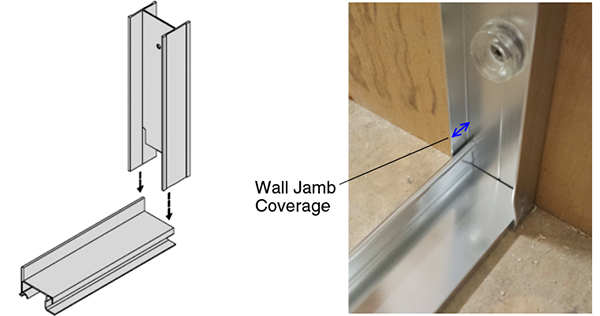 When installing the wall jambs, position the wall jambs as shown above. The shallow side should be closer to the finished wall.